ModCloth is more than just clothes! They also have some nice home decor and gift ideas. I was browsing through their site the other day and found a bunch of products that would make fabulous Mother’s day gifts! They have some pretty unique stuff! 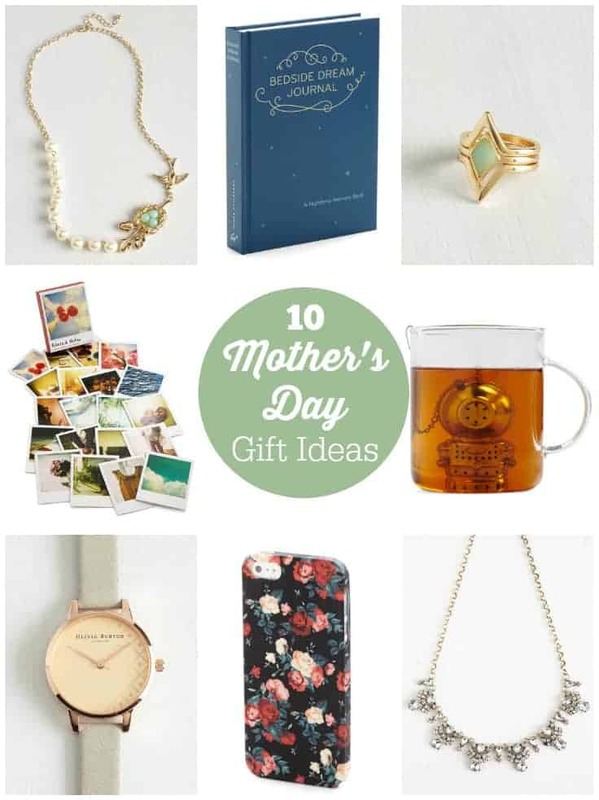 I’ve listed out my top ten favourite Mother’s Day gift ideas that I believe will impress! I know my mom would be happy to receive any of these items. 1. Nest Interest at Heart Necklace ($19.99). Show your love for tiny creatures with this ModCloth-exclusive bird and nest necklace, whose asymmetric design touts faux-pearls, a soaring sparrow, and a nest filled with blue ‘egg’ beads. 2. Bedside Dream Journal ($16.99). Enjoy a deeper understanding of last nights sleep by describing every detail within this compact dream journal from Chronicle Books! While interpreting your dreams can provide powerful insights about the subconscious, it takes practice to recall each subtle nuance, quirky taste, ambrosial scent, or recurring character. Just nestle this hardback on your nightstand, reach for a fresh page as soon as you awaken, and compose a brief account of the evening’s adventures beside its silky bookmark. After collecting your thoughts with poignant precision, reflect on each significant emotion or adventure by consulting the glossary of common symbol meanings thats hidden in the back. With this midnight-blue companion close to your bed, the sandman is destined to become a familiar friend! 3. Flashbulb Fab Necklace ($24.99). Premier this sparkling gold necklace at tonight’s gala and get ready to pose! This ModCloth exclusive boasts teardrop-shaped rhinestones and crystalline accents that everyone will want to photograph. 4. Deep Tea Diver Infuser ($14.99). Discover wondrous new levels of flavor and breathtaking aromatic nuances by warming up after a swim with this tea infuser by Kikkerland! A charming addition to your nautical apartment decor, this adorable explorer features a metallic dive suit with a fleet of small holes, which invite warm water to swirl around your signature loose-leaf tea. Just plunge this petite accessory into your wave-printed mug, allow it to drift about for the allotted time, then hoist it onto the coordinating silver tray as you enjoy a sip! With a tea infuser this sturdy and swell docked on your counter, you’ve always got ‘maritime’ for another cup or two. 5. Dew as I Do Ring Set ($14.99). You have only sweet words to say and delightful style to match – topped off with this golden ring set! Two simple bands come a point so that they fit on either side of the dew-blue enamel-touched diamond at the center of the third ring in this trio, setting a totally stylish example that friends will want to follow. 6. Worth a Thousand Words Notecard Set ($14.99). Add an extra expressive quality to your letters by writing them on these picture-profuse notecards from Chronicle Books. Including 20 different cards of poignant Polaroid-effect prints, from a little girl in oversized rain boots to a yummy looking cupcake on a dish, along with envelopes, this adorable stationary set is sure to make your letters extra meaningful! 7. Olivia Burton What Makes You Tick Watch ($104.99). Find motivation to work efficiently and unwind fully in the ticking hands of this Olivia Burton watch. Keeping count of seconds, minutes, and hours with a numberless face whose brushed gold surface is designed with a dotted grid – and secured on your wrist with a grey leather band – this classy accessory inspires you to achieve your dreams in a timely manner! 8. Nothin’ Bud Love iPhone 5/5S Case in Black ($9.99). Show your phone some love by dressing it up in this enchanting iPhone 5/5S case. Blooming with a rich floral pattern in scarlet, petal-pink, ivory, and mossy green, this flexible black case provides plenty of swoon-worthy charm! 9. Doily Specials Trivet ($14.99). Gussy up your everyday hostessing style with this aqua-hued trivet – featuring an ornate, doily-inspired design that lends charming sophistication to any tabletop! 10. Rainy Day Regal Scarf ($17.99). With this gorgeously printed scarf wrapped around your neck, there’s no reason to shun a brief sprinkle or shower! Whether the sky rains or shines, you’ll love the images of patterned umbrellas – and the people holding them – that adorn this posh accessory. Top off any ensemble, including a simply hued sundress and a pair of patent pumps, with this fringed scarf for a look that flows o’er with beauty. Good news for me because ModCloth ships to Canada. I may have to pick up a little something for me while I’m at it. I’m really loving that watch! Which Mother’s Day gift idea is your favourite? Some great ideas, I really like the Deep Tea Diver Infuser! yeah I’m eying that Deep Tea Diver Infuser too! I’m going to go read up on the world’s smallest lightest SLR as per the notecard post. Heavy cameras make for camera shake and blurry pics at least for me they do. I like the Deep Tea diffuser. It looks great to help mom with her tea. I need ideas and this is a good one and does not cost a lot. I will have to get her this! a tea diffuser! that what i’ll get her! I like the scarf. They are easy to post, look great and can be used in so many different ways. i like these mothers day gift ideas. they are really nice, and i would like to give any of them for mothers day. thank you. Some nice gift ideas, I always have a hard time buying for my mother, she has everything!! Some geat ideas. Thank you. I really like the scarf. Thanks these are all such great ideas!! Thank you for this list!! It’s got some wonderful ideas on it!! Some really great ideas – I love the diver tea ball 🙂 I actually never realized Mod cloth had items beyond clothing! What a great collection of gift ideas Stacie! Some really unique ideas there – I love it! Pinned. Love the list. Thank you so much! Love learning about new products! such wonderful ideas. I love them all….now to show my family to give them ideas. Some nice gift ideas,I love the watch ! Love the Mother’s Day gift ideas. My Mother was born on Mother’s Day along with my Grandmother. those were special days and deserving of special gifts. I believe these are those special gifts.